Jacqueline Brewster is an Associate Geologist in our Baton Rouge office, although most days you are more likely to find her in the field than at her desk. Jacqueline has emerged as a trusted team resource, leading to a recent promotion and growing role on some of GES’ largest client programs. Jacqueline joined GES after earning a Bachelor of Science in General Geology from Louisiana State University (LSU). Her academic pursuits and previous internship experience provided Jacqueline with a solid foundation for building a career in environmental consulting. 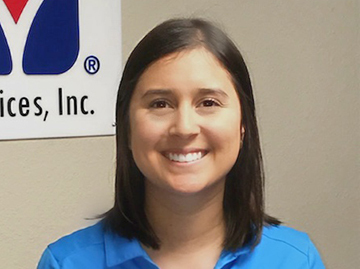 Jacqueline has demonstrated a knack for picking up new technical concepts quickly and she continues to leverage GES’ internal resources and network of technical experts to expand her knowledge base. She recently supported her first Phase I Environmental Site Assessment project, a fast-track effort comprised of multiple sites. With some early coaching and support from senior GES staff, Jacqueline was able to meet the challenging deliverable schedule while submitting high quality work in her assigned region, contributing to the overall success of a national team effort. Jacqueline’s professional development has extended beyond her on-the-job training at GES. She recently passed the Fundamentals of Geology (FG) exam, earning the professional designation of Geologist-in-Training in the state of Louisiana. She plans to pursue her Professional Geologist license in the future. GEAUX SAINTS AND LSU TIGERS! Jacqueline enjoys spending time with her fiancé and miniature schnauzer, Brees. If you haven’t guessed by now, Jacqueline is a huge New Orleans Saints and LSU Tigers fan. In the spring, you’re likely to find Jacqueline cheering on the LSU baseball team on their quest for another trip to the College World Series. She also enjoys playing golf with her family in her hometown of Houma, Louisiana or her new home in Baton Rouge. Another fun fact about Jacqueline is that she was born and spent her early childhood in Ciudad del Carmen, Campeche, Mexico, a scenic, coastal city that sits on Isla del Carmen, between the Gulf of Mexico and Laguna de Términos.